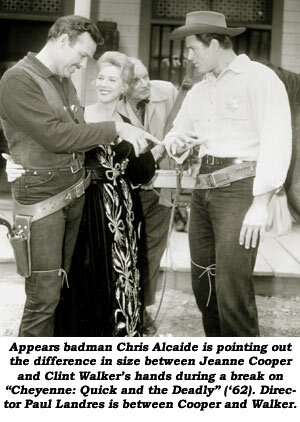 One of the meanest, nastiest badmen of the TV era—and one of the most prolific—was the always enjoyable Chris Alcaide, who received a Golden Boot Award in 2003 for his 15 years of western dirty deeds. Born October 23, 1922, in the tough steel mill town of Youngstown, OH, after a few odd jobs, Chris migrated west to California in 1942, becoming a bouncer at the Hollywood Palladium until he entered the Army in 1943. Discharged in ‘46, he was back at the Palladium until he enrolled with the Ben Bard Players which led to several plays and a film role in “Glass Menagerie” (‘50). 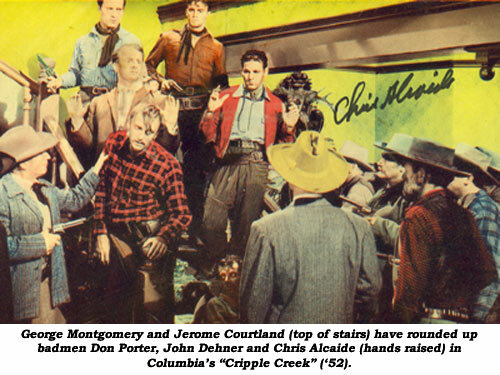 Still working at the Palladium, but now House Manager doing the band announcing, no other film roles came his way until he was cast as a heavy in a couple of George Montgomery’s westerns (“Cripple Creek”, “Texas Rangers”) and several Durango Kid B’s at Columbia in ‘51-‘52. “When I finally saw Chuck Roberson in my outfit I knew I’d arrived because now I was being doubled instead of doing my own fights and falls,” Chris chuckles. About this time a car wreck that crushed part of his chest curtailed his active westerns for awhile but Chris was able to do a small but showy role in Glenn Ford’s “Big Heat” (‘53) which led to other gangster films and finally back into westerns by ‘54 where his snarling, mustached presence was sorely needed, especially with the onslaught of TV westerns then being made. 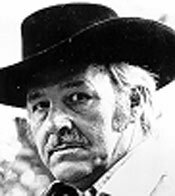 For movies Chris had some great lines in “Overland Pacific” and roles in “Black Dakotas”, “Massacre Canyon” among others—but TV became his forté as the small screen found him week after week in “Kit Carson”, “Tales of the Texas Rangers”, “Annie Oakley”, “Broken Arrow”, “Gunsmoke”, “Bronco”, “Sugarfoot”, “Have Gun Will Travel”, “Big Valley”, “Rifleman”, “Rawhide”, “Wanted Dead Or Alive”, “Two Faces West”, “Cheyenne” and dozens more through the late ‘60s. In 1958 Chris almost turned his career around and became the hero in a series. 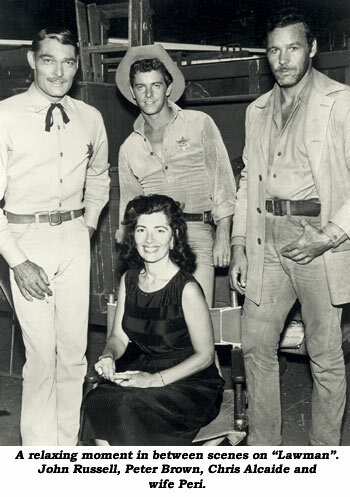 In fact, he was Clay Culhane in the pilot for “Black Saddle” shown on “Zane Grey Theatre” as “Threat of Violence” but studio reps thought he’d played too many heavies too convincingly and recast the series with Peter Breck. A back-handed compliment if there ever was one! Also during that pilot, he injured his back which continued to bother him until he decided in the late ‘60s to leave the film business. He and his wife, Peri, operated an antique photo business from ‘72-‘85 at an L.A. storefront, catering quite heavily to people in the film industry. The acting bug bit again in ‘80 and Chris accepted a few roles with his last part being opposite Charles Bronson in “Assassin” (‘86). Meantime, Chris and Peri moved Peri’s Pictures to their Palm Springs home. “I enjoyed the hell out of it! I loved it, very few guys I knew enjoyed it as much as I did,” Chris smiled. And to the viewer, his enjoyment showed. Chris always put everything he had into his work as one of the television’s era’s best badmen. We lost him June 30, 2004.